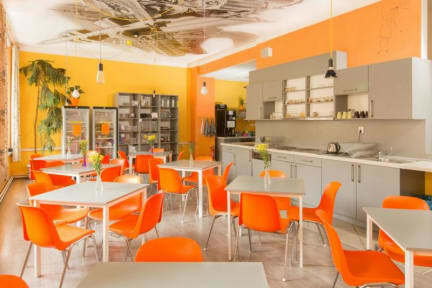 Hostel DownTown i Prag, Tjeckien : Boka nu! It is necessary to give returnable deposit 20 Euros per person at reception desk on your arrival for eventually damages. It is necessary to give returnable deposit 20 Euros per 1 person at reception desk on your arrival for eventually damages. Enjoy your stay with us - in the most popular hostel in Prague (according to HOSCAR awards 2018), famous for many activities, situated exactly in the historical centre of Prague - only 10 min walk from OldTown and Charles Bridge and 5 minutes from Wenceslas Square. We can offer you high accommodation standard in newly renovated rooms with private or shared bathroom. Several rooms (especially the 5th and 6th floor) offer a magnificent view of historic Prague. For backpackers, we offer spacious dorms with their own lockers, drawers with lamps either only for women or mixed. What can you do in hostel Downtown? Our international FUN staff team (Brent form Canada,Katie from Ireland, Gil from Brazil, Mirek from Czech) is doing programs for our guests every day which is mostly for free. You can enjoy Prague Castle walk, Old Town walk, climb Petřín Hill, draw on Lennon’s Wall, taste many types of Czech beer in the best Prague pubs, enjoy Cooking and Baking sessions, Pub Crawls, Bingo, Beer Pong, Morning run and much more. You can visit our big common room, which offers many activities for everyone - you can play the piano or guitar, play table football, table games, read from our international library or just relax on several sofas with many pillows. You can also use our modern, fully equipped kitchen for free, where you can prepare your meals 24 hours a day. There is a refrigerator, a microwave, an oven, a kettle and much more. What can we offer you for free? Exchange machine (you can exchange Czk, €, $, £) - No commission! What can we offer you for a fee? Buffet breakfast between 8:00 and 11:30 (EUR 5), children under 10 years (EUR 3 ) - All you can eat and drink! 24hr refreshments - cold drinks, coffee, etc. What can you borrow for a small deposit? Who is working at the hostel? Living here might be the best decision we made in Prague, the location is amazing - close enough to everything but still quiet for you to get some well needed sleep! The staff was something out of another world, being so helpful and friendly they really made our stay special. I would also recommend joining in on some of the hostels activities, especially on the free walking tour! Thank you for making our trip so wonderful! This is one of the best hostels i have ever stayed in. Perfect for solo travellers because of all the fun activities. Free walking tours every day, great breakfast, high security and nice staff. The only bad thing was the noise from the street (construction), bring earplugs and that there was nowhere to charge ny phone next to my bed. This hostel is the best I've ever stayed at. Just in the centre of town, perfect for walking around Prague. The staff was outstanding, they offer activities every day, often for free. They were so nice and helpful, really made sure we felt welcome. The rooms are spacious and clean, with working wifi. The only downside was that there was no air condition and quite noisy outside at night. But if you are backpacking around Europe, as I am, this hostel really couldn't be better! I loved this place!! Location is perfect, you can walk everywhere. The staff and the atmosphere is so good!! Funny events every day (walking tours, wine/beer tasting, free dinner etc) which makes it very easy to meet new people! Feels very personal and welcoming, one of the best hostels I've stayed in! Best hostel in Prague. Close to everything and great atmosphere at the hostel. They have events, free tours and free dinners at some points. There is always a weekly schedule. I recommend!! Great for the price. But bring ear plugs if you stay Saturday night - Sunday. Super nice staff. I did not participate in any activities which i highly regret, it was such a good vibe from everyone who was staying. The location was amazing! Perfect option for anyone travelling solo! Daily activities and walking tours gives you the opportunity to meet other travellers looking to socialize. Really good location! Nice breakfast. The dorms are rather basic and lots of noice crept up from the street below at night, but other than that I've got no reservations.